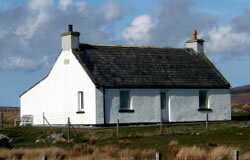 Grand View is a traditionally built crofter style cottage on the island of North Uist that has been in the MacDonald family for four generations. The cottage provides an ideal base for touring of the Uist’s and beyond, being located on the west of the island, overlooking the island of Kirkibost. Perfect location for pure relaxation, photography, birdwatching, walking, fishing, water sports and getting away from it all! The spacious livingroom has an open fire and overlooks the Island of Kirkibost to one side. The sofa is also doubles as a sofa bed. Please let us know when you enquire if you require the use of the sofa bed. The bathroom has a low level WC, sink, electric shower and shaving point. Grand View is located on the west side of the island in the crofting township of Claddach Kirkibost. The cottage is set in private grounds with uninterrupted views of both land and sea.